I have so many wonderful things to share with you, dear reader, but the busy-ness of this season has me continually bumping “blog post!” lower & lower on Ye Olde To Do list. 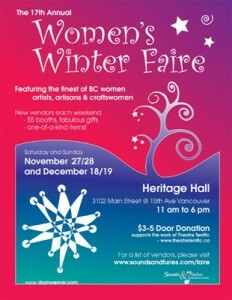 The Christmas countdown is on and I’m down to one last market of the year; next weekend at Heritage Hall I’ll be taking part in the annual Women’s Winter Faire for the very first time. Come on down, Vancouverites! This market is incredibly in its 17th year & I’m very happy to be finishing off my holiday season with something that gives back to the community. Donations accepted at the door as well as a portion of the vendors’ earnings will go to benefit the Pride Education Network, an organization that “advocates for an inclusive, respectful environment for all students, staff and families, regardless of their actual or perceived sexual orientation and/or gender identity, within all B.C. educational institutions, through the development of concrete supports, policies, resources and actions”. For a full list of vendors who will be joining me, click here.